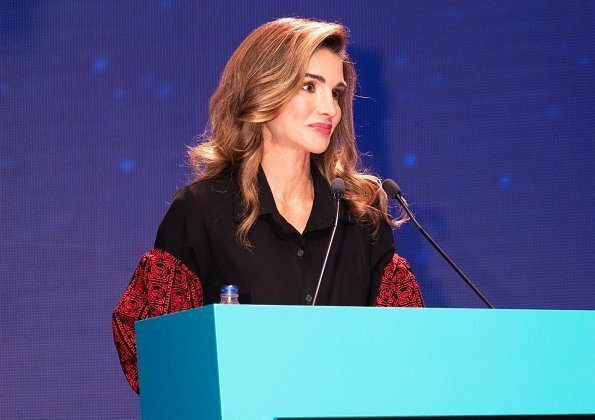 On October 4, 2018, Queen Rania attended TRT World Forum 2018 held at Swiss Hotel The Bosphorus in Istanbul. 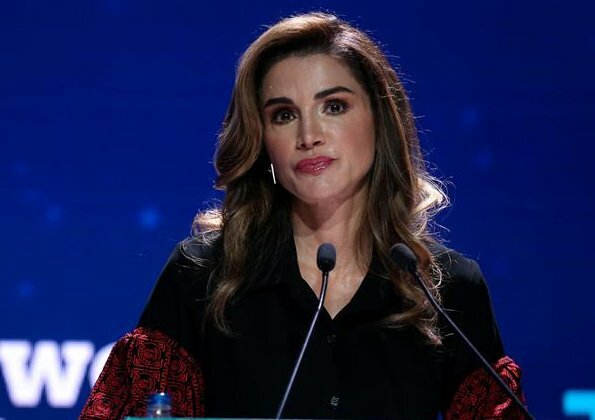 Queen Rania met with President Recep Tayyip Erdogan and First Lady Emine Erdogan at the forum’s closing evening. The second annual international forum of Turkey’s public broadcaster, TRT World, opened in Istanbul on Wednesday, featuring opinion leaders and decision makers. The two-day event was held under the theme "Envisioning Peace and Security in a Fragmented World." She would do well to wear more simplified outfits. This one is a thumbs down with the odd sleeves and clashing reds. Red & black my absolute favourite combo but I wish the blouse was plain black. The sleeves are weird. Love Rania's full sleeves, but I think the fullness of the skirt fights with them a bit. A pencil skirt in black, or in the same black and red print as the sleeves, would have made this outfit perfection, imo! That said, Rania -- like some of our other royal ladies -- is so gorgeous that she would look good in anything :-). Love the skirt, don't mind the style of the blouse but think all black would work better. Rania draagt de laatste jaren de zotste kleren. Listen she suppose to be a queen or in better words the kings wife, she should act accordingly, she is not a model as she is acting now. What do you mean with "she should act accordingly"? And no, to call her "the kings wife" are not better words than to call her a queen. King's wife? Really? No, her title is queen and she does act and look like a queen. She seems to be an independent-minded person which I appreciate. Queen Rania’s dress style has always been too fru fru for my taste. I have the same problem, I do not kind of understand her clothes. She must very very fashionable and still always something is lacking or is too much to my taste. This must be cultural thing. I want yo like the blouse, but it's just impossible. Too much going on here, the end result looks like some sort of regional dress. IMO she would look so much better with a shorter more modern hair. The sleeves have some kind of traditional beadings. The total look is ok.
Nice skirt but the blouse is a no.